Polymer-covered Altoids boxes logged nearly half a million views this week on Reddit. Another Van Gogh discovered! A blogger named Qoth posted an album of his mother’s creations and they were an instant hit. The footed boxes are heartfelt tokens made as gifts for family members. Small, humble artworks can still strike a chord in the hearts of online fans. Thousands were amazed at what could be done with polymer. The link came to PCDaily from Society of American Mosaic Artists trustee Sharon Plummer. I think there is a nice balance between the embellishment and the restraint of not covering the entire box. And the little feet are brilliant! Almost a tiny shrine to the master of color. Thanks! 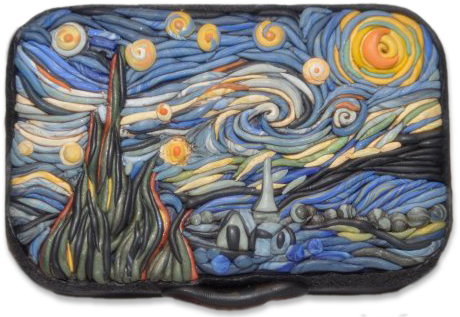 You can never go wrong with Starry Starry Night. This is so beautiful! Huge Van Gogh fan. Love it, love it, love it!